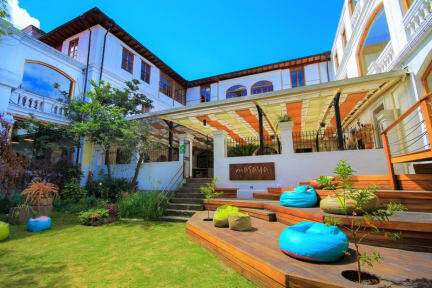 You can now enjoy the perfect hostel experience while on the Andean Capital. Sit back and enjoy the unique Masaya hospitality while soaking up the sun and the volcanoes surrounding Quito! Masaya hostel is passionate about Ecuador and travel; our aim is to give you the opportunity to dive in the local experience. We want you to sample the local delights, enjoy the magic hospitality of Ecuadorians and take part in some unique cultural experiences. This is the ultimate place for relaxation where you can chill out by the gorgeous garden, find a quiet reading spot or join in our daily cultural activities. Breakfast included for private rooms only, not dorms. Price : 4 usd. A great hostel. Really clean with a great atmosphere. Huge amounts of activities offered every day of the week. Really helpful and friendly staff. Beds were very comfortable and loved the privacy offered by the curtains. Bathrooms were clean and had hot water. Person downstairs was hepful and nice, cant ask for much more. Good place to explore Quito from. Rooms need some sort of sound absorption. Worth your money and time to stay here. Exceptionally well positioned, incredible value for money. The staff were helpful and the kitchen/restaurant was absolutely incredible. My favourite part of this hostel was the oversized beds! They're basically double beds, and super comfortable. Best beds I found in all of my South American hostels. Excellent hostel. Staff really friendly and helpful and the restaurant is superb! Highly recommend! The place is very beautifull and the location is very good to visit the old city. The food is very good and the staff is very nice. The activities are very boring, you should create a hot pool in the garden and improve activities to be a top 10 hostel. The bathroom can be also improved with hand towels and amenities, I didn`´t like the way you put the paper toilet in the private bathrooms, the street is a little noisy during the day, you can also install Soundproof windows. Really friendly staff that is always helpful. Decent restaurant, but not exactly cheap. The building is very nice, but it squeaks nonstop. It was impossible to get a good nights sleep because sound carried so bad through the floors and walls. Stayed 1 night in a 6 bed dorm. Beds are comfortable and spacious but have blinds instead of curtains. The blinds are VERY loud and you will be woken numerous times. Water was hot but bathrooms should be improved, like adding a toilet roll holder and soap dispenser. Restaurant food was ok - our dinner was lukewarm and breakfast is very basic for the cost. Staff are incompetent. Tried to charge us on check out when we'd already paid. I had to go dig my receipt out of a bin to prove payment.